It was so good to get home yesterday, but the transition process is a mixed bag of emotions for me. Saying goodbye to friends from the workshop… being excited to try new techniques in the quiet solitude of my own studio… trying to catch up on paperwork and laundry…remembering it was trash day… planning meals for just 2 of us again… All day I puttered from thing to thing, accompanied by the oddest feelings. Though I did not get into the studio, I accomplished more than I thought I would, while carrying around an empty feeling in the pit of my stomach that seemed to be a combination of melancholy and excitement. 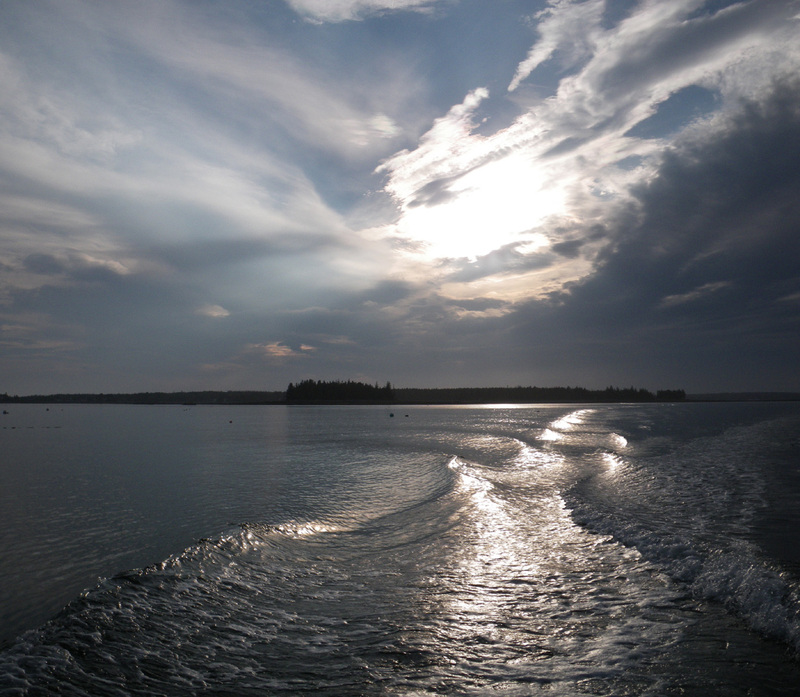 If I could paint what this re-entry feels like, it would look like this view from the ferry around 5 p.m. yesterday, looking back at Great Cranberry Island as I headed home to Islesford. my re-entry consisted of 3 loads of laundry, 4:45 wake up, piles of drawings to grade, and holding my friend’s head (applying gentle pressure) to ease the pain of a bad concussion she had just gotten, waiting for the ambulance for 30ish minutes…. (and trying to keep her conscious the whole time)…. bye-bye, peaceful feelings of creativity! Oh Holly, yuck! I hope your friend is okay. Somehow we’ll get the peaceful feelings of creativity back…..but maybe not for a little while. Although today, I spent a cold rainy day drilling rocks and listening to a book on CD. It was pretty darn close to peaceful with creative potential. I love the “painting” you took from the ferry. It is really full of feeling….the wake of the boat symbolizing leaving something beautiful behind, at the same time knowing that you are heading toward the comfort of home. Sorry to hear that your re-entry was rough, Holly. Hope your weekend was restful! Glad to hear you could drill rocks and listen to books, Barb. Can hardly wait to get out to the studio myself to listen to CBC (our public radio) and work on finishing my piece from Celie’s.